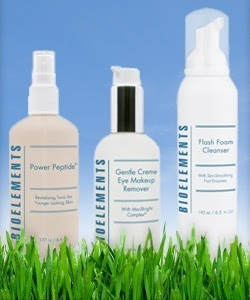 Sassy Lassie Reviews: Bioelements Giveaway!! As many of you know, I love me some Biolelements. I am a faithful user and proclaim it's goodness to all who will listen. Heck, I will even proclaim it to those who won't listen! Well today I am happily offering one lucky winner a plethora of Bioelements products. And just what do you consider a plethora Kat?? How does over $250 worth of amazing Bioelements products sound to you? Oh, you heard me right - $250 worth of amazing Bioelements products! The winner will receive a total customized package of skin care goodness which includes a Cleanser, Toner, Moisturizer, Sunscreen,Exfoliator and night-time product. The winner will also be able to discuss their skin type and concerns on a private phone consultation with a Bioelements esthetician. When the seasons change, we change our wardrobes. But did you know that your skin care should change too? Time to swap out those heavy winter crèmes and take on a new skin care routine that delivers exactly what your skin needs. Start off the warmer season with products that will make a major difference in the appearance of your skin. So what are you waiting for?? Enter!! It's easy to do - just leave a comment (including your email) and you are entered to win. Really want to win?? Then tweet away for extra entries! I will pick and post the winner on April 12th. Good luck! But seriously, that looks like some awesome stuff! Plethora indeed! What a wonderful giveaway! Thanks for the chance to try these products ...they look fantastic. I am in need - in NEED I tell ya' - of an eye cream that will help flatten these crazy wrinkles around my eyes. I've sent your giveaway out into my Twitterverse! You know what I just noticed after sending this? Your blog name uses the spelling "Lassie" but your Twitter ID is "Lasie". Are you telling me someone else is trying to be sassy too? I won't have it. Yay! I love Bioelements! Thanks for sharing such a great giveaway! Cruising through from the UBP to say hi :) Would love to win , thank-you for the wonderful giveaway! Dropping in from the UBP to say hi! Been reading through your reviews :) If winner hasnt been chosen already, I would love to win!